No Age is on the verge of rising to the level of the punk royalty. 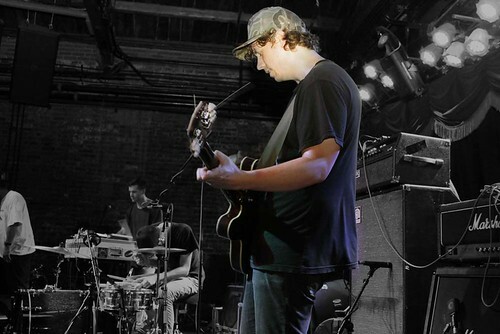 After a productive five-year history where the Sub Pop duo have collaborated with everyone from Bob Mould to Dan Deacon, have produced two outstanding albums and a plethora of singles and EPs, and remained true to their DIY aesthetic, No Age is poised to release what may be their “Zen Arcade” — Everything In Between (due in September), an album of musical and emotional growth which expands their dark and aggressive sound to something beyond punk. Last Sunday at Brooklyn Bowl, five of the new album songs were on display mixed within the classic No Age material, and in some cases surpassed the older songs. The track streamed below (the song titles for the album are available but not apparent from listening) was one of the strongest numbers in the entire set. No Age has added a third member for the touring band (keyboard and effects) but still retain that manic energy that have propelled them thus far. We can’t wait for September. This set was recorded in the same manner as the Cap’n Jazz set from the same show. This recording accurately reflects the sound in the venue that afternoon. Enjoy! An nyctaper recording of No Age at Above The Auto Parts Store in October is still available here. I just wanted to say thanks to all the people who make NYCTaper possible. I live in Perth, Western Australia and will probably never get to see any of bands you’ve recorded (except for Flaming Lips & No Age). So thank you so much to all involved for all this great free music. I’d like to thank you good people from NYCTaper as well. I’m living in Dortmund, Germany, which gives me the opportunity to see some of those groups whom I well might never got know without your fine work – lately the Wavves were in MÃ¼nster, somewhere near my home town. I naturlley don’t like all of the groups you present and sometimes the sound quality is not satisfying enough to me, but most of the time I have problems in even listening once to what you offer. Thanx a lot!